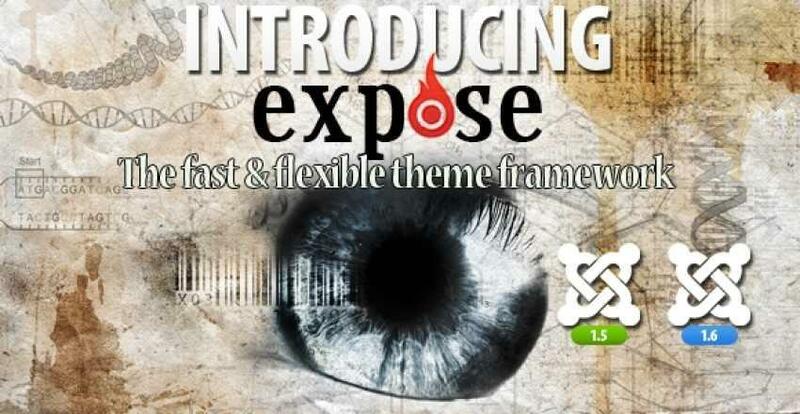 Expose is our next generation template framework for Joomla! While creating this framework, we used our experience and considered our user needs all together. We carefully reviewed user demands and the unfortunate problems they had to face with our templates before. We fully devoted ourselves to make this new framework and after a full month of hard work we are proud to introduce Expose. This framework is for novices to professional means that you really don’t need to code a single line to make a beautiful, rich, user friendly website for modern devices like iPhone, Android, iPad and all browsers. Often people think framework means lot of bloated codes which slow the site down, but we assure you that expose comes with a structured code base with necessary features to make cross platform themes. Inbuilt jQuery with many versions. No more conflicts with jQuery! CSS and JS Code compression and optimized for speed. Joomla! 1.5 and 1.6 compatible. Styling a template is nightmare for novice users, so we make styling easy with visual color editor. Now you can style every major part of your template without writing CSS code! We know too much features create confusion but we hope you would really enjoy Expose admin panel as it is easy to use and thoroughly documented. Expose comes with new module architecture and will give you a new delightful user experience when editing module width via expose layout settings. You can structure your modules with many styles which in impossible on other frameworks. We built an intelligent module parser so if you accidentally do something wrong on its settings, it will automatically structure itself! Expose also support 3 different layout styles. In our upcoming post, we will try to describe our layout features and how it will make your template life easier. Content is king and we really care about our content styling. Now you can expose your content with more fashionable way and you will have full control over your typography. Expose gives you an easy to use typography panel, using this panel you can easily select your fonts, fonts selector and custom CSS. Expose comes with many mobile positions and these positions will become visible only on mobile devices while others module position will not load that means our website will load on a mobile device very faster. Expose offers CSS and JS compression engine which will cache your CSS files and compress the code. All CSS files will compress into one file so it will reduce many HTTP requests and compression will make your file size very small. All files will load from cache for faster performance. Expose presents you a perfect RTL property integrated facility. Stylize your website with trendy fashions by positioning the text in beautiful alignment thus making your page more catchy and cool. ThemeXpert always welcomes 3rd party extension and Expose is not an exception from this perspective as always. Combining our themes with foreign extensions is quite easy as clicking the mouse few times. So that’s what Expose is! For a better user experience integrated with rich, high quality, modern facilities grab a theme built on Expose framework. If you want to add, remove or modify Expose is ready to serve all your purposes without any extra hassle of coding. A stunningly strong amalgamation of faster performance, compatibility with every platform there is, cross browser compatibility, easiest customization, user friendliness, Expose templates should be your choice for your next project or your current site if you are looking for something fresh!